We have many stories to share - and for starters - this first is by a teenager from Massachusetts - it has been 'sanitized' to remove the identity of the children. This past mission trip has been the most inspiring one yet. We both have been on various mission trips including different types of work and life styles. 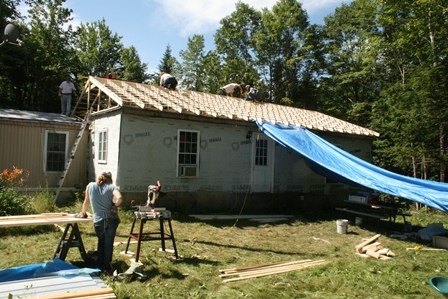 The mission trip to Farmington Maine changed our views on the world. The people we met between ‘Paul’ and the little children, ‘John’ and ‘Peter’ changed our lives forever. 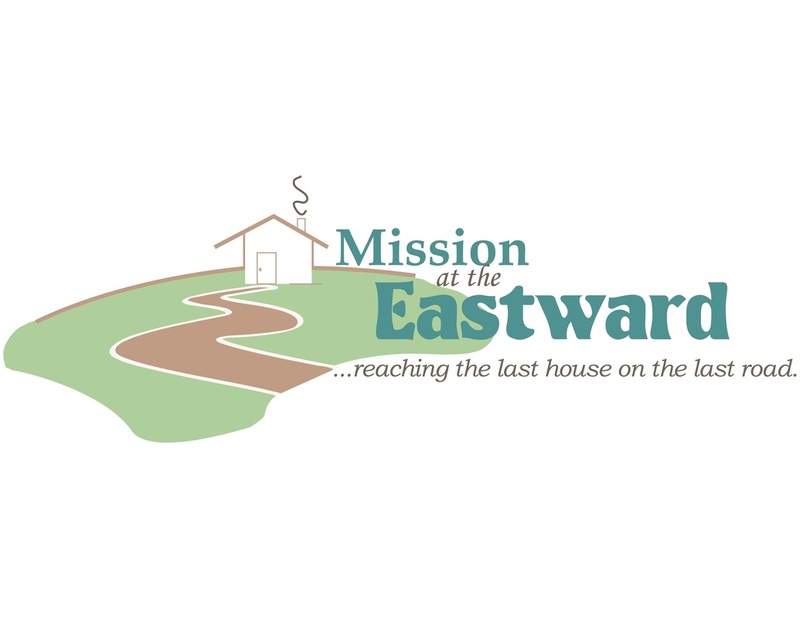 The mission trip was a call from God we truly believe because we were able to change the lives of two boys and our entire youth group helped ‘Paul’ with his depression and loneliness. The entire week we wanted to be the hands and feet of Jesus Christ. We were privileged to be able to visit ‘Paul’ on the first day in which we got a bunch of jokes and laughs out of him. ‘Paul’ was a retired veteran and served on the police force for many years. In the last five years he lost his wife and his friend who he lived with. While we were moving logs to heat the house, he called Tom up to talk to him. He explained to Tom how he had been recently depressed and very lonely because he didn't have visitors. Tom spent hours talking to him every day for three days. As we were leaving the first day, Tom spent his own money to buy him hamburgers, chips and cupcakes to eat because he hadn't had a real meal besides peanut butter sandwiches for many weeks. ‘Paul’ was able to make us laugh just as much as we made him smile. At one point he tried to guess all of our ages and he assumed Tom was 23, Jess was 14, I was 12, and Trevor was 23. Because he thought I was the youngest, he cracked a joke saying that I still drink out of a baby bottle because of how my water bottle looked. Truly, ‘Paul’ changed the lives of everyone on the Mission Trip who was able to help him. Really, I believe ‘Paul’ changed our lives even more then what we were able to do for him. The most touching part of the trip would be when we met ‘John’ and ‘Peter’, two little boys the ages of 8 and 10 who lived in a 2 room house filled with dirt, clutter and junk. When we were hanging out with the children alone, we learned their father had killed himself and they are now stuck with an abusive stepfather. The children opened up to us very well stating everything that had happened in their lives. It was shocking to hear that such young children had been through so much, remembered everything in such details including getting sexually abused by their step dad’s friend. These stories that we heard were so heartbreaking that we didn't know what to do besides tell them to stay in counseling, stick together as brothers no matter what happens in life, and we gave them our phone numbers if they ever needed to talk. When we wrote our numbers down the oldest boy, ‘Peter’ laughed and said “Now that is how you get a girls number” and everybody laughed. As well, I taught the children how to pray and told them if something was going wrong you could always look to Jesus. But overall, we had a blast hanging with the children. On the first day we started a clay fight. The clay is one of the only toys the children have and they go down the street to the stream to dig it up. We went down to the stream with them, rode bikes with me, Jess taught them how to take selfies, and I let them play games on my phones. Mary, Oliver, Billy, Jacob, Kevin from the ministry and Brady got together with us and we had a clay throwing fight. The kids had a blast with the clay and everybody was dirty from head to toe. At one point, Brady accidentally threw clay into a car driving past and the man got out and started yelling at the little children and us. Jacob stood up for everyone and told the guy that we were just having fun and they eventually drove off. The clay fight made all of us realize how much fun you can have with the little that the family has. One the second day, we were able to spend the entire day just working with the children, getting more clay, talking to them more, playing temple run on Cierra's phone. At lunch time, while we were all eating lunch, the kids explained to us that they didn't have any more food stamps and they had no more food besides corn dogs which needed to be used for dinner for the next week. Oliver, Nick, Maddie, myself, CJ, Brady and Ireanna all gave the children chips, grapes, our sandwiches, bananas, apples and waters to have. We all believed it was the right thing to do. It was emotional having to leave the family and especially the children. As we were leaving we realized how we had touched the lives of the little children. The youngest child, ‘John’, kept repeating and asking me if we could take him to Boston with us. He told us that his mother and step father wouldn't care or even notice if him and his brother were gone. ‘Peter’ said that his step father would be so happy they were leaving that he would throw a party. It broke our hearts to have to hear how much they wanted to come with us. Jess and I gave them hugs and kisses and told them we loved them and they said it back. The children insisted that we stayed with them or take them with us. ’John’ wanted me to ask his mom they could come on a vacation to Boston with us, to go to The Red Sox, Chuck E Cheese and take them to the beach. When we left CJ and I realized that we needed to keep in contact with the children by calling them, writing them letters and sending them gifts. Yesterday we called them and we are planning to write them a letter and send them the movie Frozen because they had always wanted to watch that movie. We are hoping that everything goes well and the children receive the movie and our letters. We are hoping to stay in contact with them for a long time and even praying that we can see them again someday. We have a mission and we have already asked our moms if we could even take the children for a week. The boys want to come visit our church family and be able to see all of those who worked at their house during the week. We are going to put our ideas to God and see what the future holds. The story on the left is about the impact on the people - both the volunteers who give and receive so much - and those they meet in Maine - who also give and receive so much. Below are some examples of the 'stuff' done during the summer. 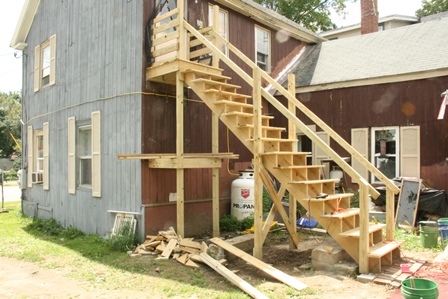 How to get "from there" to "here" - by building a super-long set of steps, of course! 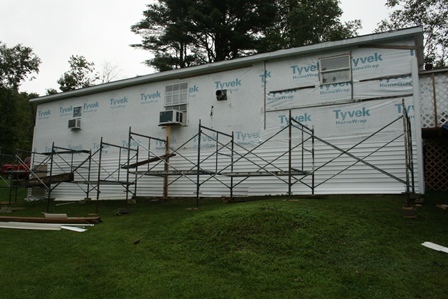 How to keep out the wind and rain - not to mention the 4-letter word "SNOW" - easy; lots and lots of vinyl siding! How to keep the water from the addition to the mobile home from leaking into the rooms where the two buildings meet? NO PROBLEM - we'll just add a little roof over EVERYTHING! How to keep the water, ice & snow from falling on your head? Or keep the wind from rushing into the house every time you open the back door? EASY! 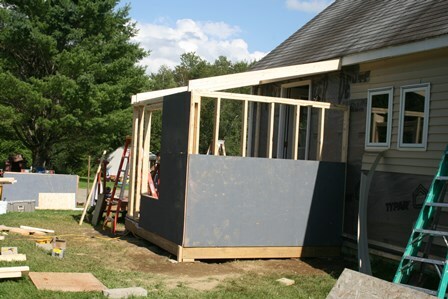 Just build a little enclosed deck and make sure the door faces EAST, not NORTH!